Director of the Department of Gender Affairs, Celia Christopher (left) with Hon Wendy Phipps at the Domestic and Sexual Violence Policy Launch. 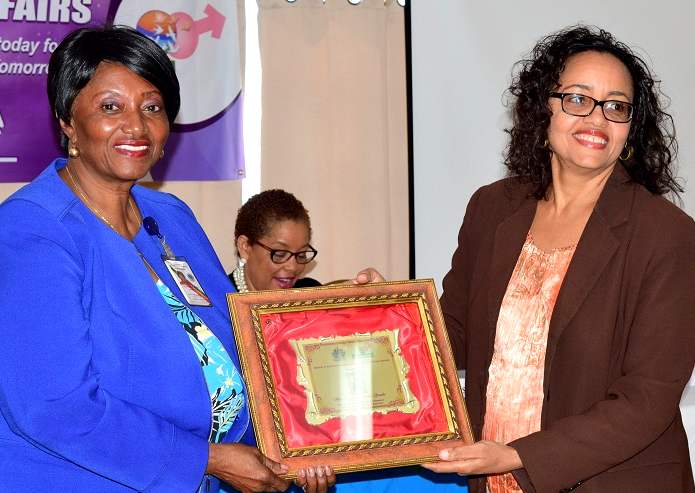 BASSETERRE, St. Kitts — Sexual and domestic violence crimes in the Federation now have a clear set of guidelines to govern them. This was made possible by the recent official launch of the Complaint and Response Protocol on Domestic and Sexual Violence, which took place on Nov. 28. The Complaint and Response Protocol, funded by UN Women and the Pan American Health Organization (PAHO), is designed to document key organizations in the Federation that provide services to survivors and complainants of domestic and sexual violence. The policy educates key stakeholders in the healthcare, education, childcare, social support, legal and criminal justice system sectors. It provides guidelines for training on the appropriate procedures to follow when a crime of this nature materializes. It addresses first response procedures, best practices for law enforcement, emergency and medical services, social services, victim advocacy and legal action. Minister of State with responsibility for Gender Affairs, the Honourable Wendy Phipps expressed her full support for the launch of the policy and said that it will help to strengthen the legislative framework surrounding sexual and domestic violence crimes. She said there will be ongoing sensitization campaigns to remind persons to reinforce the procedures in the protocol, as it is important to handle these types of delicate situations appropriately. Director of the Department of Gender Affairs, Celia Christopher said that, in 2017, the country recorded 353 cases of domestic violence. She also noted that the policy will be very important because it provides information that is helpful to the department with respect to developing programmes for victims.